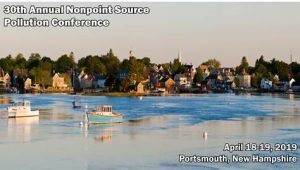 30th Annual Nonpoint Source Conference, Portsmouth NH – Invitation to Exhibitors and Sponsors! Since 1990, New England Interstate Water Pollution Control Commission (NEIWPCC), in partnership with its member states, has been coordinating the Annual Nonpoint Source (NPS) Pollution Conference, the premier forum in our region for sharing information and improving communication on NPS pollution issues and projects. The conference brings together all those in New England and New York State involved in NPS pollution management, including participants from state, federal, and municipal governments, as well as private sector, academia, and watershed organizations. You are invited to join the conference as an exhibitor or sponsor. Why should your company support with the Annual Nonpoint Source Conference? In one word: visibility! Being an exhibitor/sponsor at the Nonpoint Source Pollution Conference gives your organization the opportunity to network, build and maintain customer relations with existing clients, and widen your exposure to the NPS community. With a guarantee to reach NPS professionals from around the region, this conference provides an excellent marketing vehicle to a targeted and attentive audience. Registration for all Attendees & Exhibitors/Sponsors will open in February! Space is limited and designated on a first-come, first-served basis, so please reserve your spot as early as possible once registration opens! Hotel reservations at the Sheraton Portsmouth Harborside Hotel can be made by calling 1-603-431-2300, and requesting the “30th Annual Nonpoint Source Conference” group block. Conference registration does not include hotel accommodations. We look forward to seeing you in Portsmouth, NH in April! We will be highlighting all of our exhibitors and sponsors via social media channels. Questions on Exhibiting or Sponsorships?